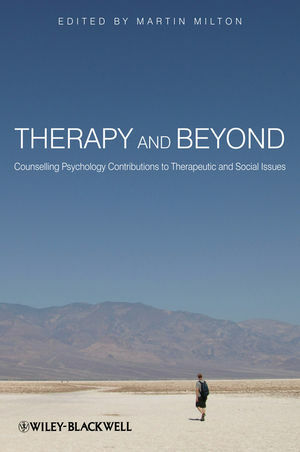 Therapy and Beyond: Counselling Psychology Contributions to Therapeutic and Social Issues presents an overview of the origins, current practices, and potential future of the discipline of counselling psychology. MARTIN MILTON is based in the Department of Psychology at the University of Surrey. He is a chartered psychologist, a British Psychological Society (BPS) psychologist specializing in psychotherapy, and a UKCP registered psychotherapist Martin worked in the British National Health Service and currently runs his own independent practice He has also been active in the BPS Division of Counseling Psychology. Introduction: Therapy and Beyond: Counseling Psychology Contributions to Therapeutic and Social Issues. Section 1: Fundamentals of Counseling Psychology. 1 Philosophical Pluralism: Navigating the Sea of Diversity in Psychotherapeutic and Counseling Psychology Practice (Donal McAteer). 2 Existential-phenomenological Contributions to Counseling Psychology’s Relational Framework (Elena Manafi). 3 Counseling Psychology and Research: Revisiting the Relationship in the Light of Our ‘Mission’ (Deborah Rafalin). 4 Understanding Human Distress: Moving beyond the Concept of ‘Psychopathology’ (Martin Milton, Mark Craven and Adrian Coyle). 5 Being with Humans: An Evolutionary Framework for the Therapeutic Relationship (Frances Gillies). 6 Ethics: The Fundamental Dimension of Counseling Psychology (Camilla Olsen). Section 2: Models of Practice. 7 Different Theoretical Differences and Contextual Influences (Riccardo Draghi-Lorenz). 8 Humanistic Contributions to Pluralistic Practice (Heidi Ashley). 9 Psychodynamic Contributions to Pluralistic Practice (Debora Diamond). 10 Cognitive-behavioural Contributions to Pluralistic Practice: Reflections on an Issue of Some Contention (Terry Boucher). 11 Amor Fati: Existential Contributions to Pluralistic Practice (Elena Manafi). Section 3: Counseling Psychology and the Wider World. 12 The Counseling Psychologist Working in a Pain Context (Natalie Hession). 13 Working with Sport and Exercise Psychologists: A Winning Combination? (Jill Owen). 14 The ‘R’ Word (Joanna Lofthouse). 15 Counseling Psychology Contributions to Understanding Sexuality (Colin Hicks). 16 Counseling Psychology Contributions to Religion and Spirituality (Adrian Coyle). 17 Counseling Psychology and the Media: The Highs and Lows (Lucy Atcheson). 18 Coming Home to Roost: Counseling Psychology and the Natural World (Martin Milton).